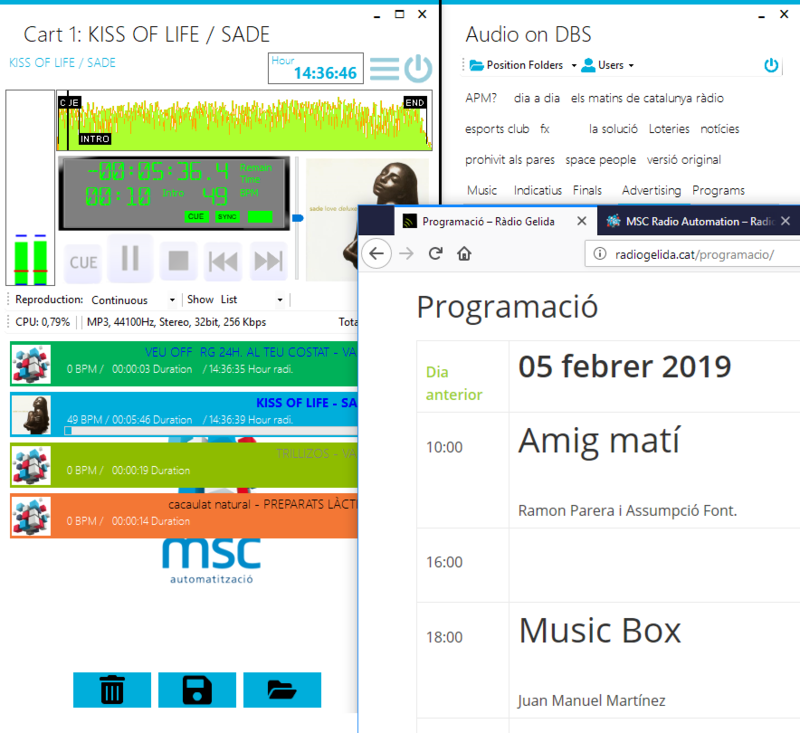 MSC Radio Automation is a set of programs and services for the complete programming, radiation and publication of the contents of a radio station. Here you can download the free MSC Radio Automation Suite. These programs are fully operational and you can use them with complete freedom. All the computer technology of your radio into a single service. We give you the tools to easily create quality programming and expand the contents for all channels. We adapt to your needs and benefits we offer new tools to go much further. Autonomous operation without repetitive tasks. Changing any parameter in real time. Import from most popular audio formats. Import data via mp3 TAG or CDDB for audio CDs. Players with advanced features for live producction. We adapt to your benefits needs. API web and plugin WordPress. User configurable controls to establish security and customization screens. Equipped with a control system anomalies and failures that any incident alert. Web-featured synchronous and ability to share content between broadcasters through the common platform. At MSC-Soft we want to establish a very direct relationship between the development team and our clients. Thanks to this, we have managed to make some programs that are very practical and adapted to small and medium-sized radio stations, providing powerful and practical tools to make the most of the resources of the radio. We have developed some services that work integrated with our programs and thus minimize the management and maximize the value of your content. And we even provide unprecedented functionalities so far in the sector. Knowledge management OnLine (user manual, how to do, FAQ, discussion forums, etc). Active participation in the new features of the system. Technical support via mail, telephone or remote desktop without restrictions. Source libraries to implement your website and provide it with interactivity.